By the time Jake was 17-years-old conflict in the family had become too much for him to bear. Jake struggled to stay in sync with his family who did not understand him or his goals. As he explored his own ideas and beliefs, he and his parents drew further and further apart until the household dynamic become toxic and unhealthy. His father became more toxic in the home and Jake felt unwanted and unloved. Jake felt like there was no way out. It was when he made his second suicide attempt that the State of Idaho stepped in and required his family to get help. They found Idaho Youth Ranch. Over time Jake came to see that his parents were trying to help him but didn’t have the tools to do so. 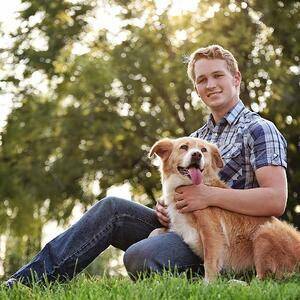 Today, Jake is a student at Idaho State University studying nuclear engineering with the help of an Idaho Youth Ranch Alumni Scholarship. He still maintains a healthy relationship with his mother and siblings. Jake’s scholarship has helped him fast track and he is set to graduate with his degree in 2020 when he plans to start working towards a Master’s degree.